This morning my older boy followed hubby and I to the market. Whilst I was queuing for some yu tiao (Chinese fried fritters), he asked if I can make some tau suan for him since we have yu tiao at home. So I got my domestic helper to help me steam some mung beans (split yellow beans = green beans without skin). The trick to this dessert is not to oversteam the beans as you will be cooking it in the sugar pandan leave water further before adding sweet potato starch. 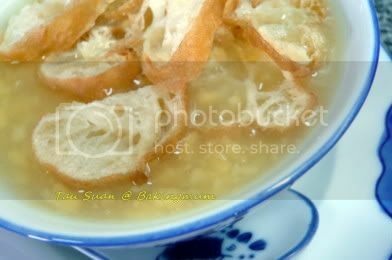 Here you have my home made tau suan. 1. Soak mung beans for 1 hour. Drain and steam mung beans in a steamer for about 30minutes. The mung beans at this stage is still quite hard. 2. Boil a pot of water of roughly 1800ml and add a bundle of pandan leaves inside. Bring the water to a boil and then add sugar to taste. Pour in steamed mung beans and stir and cook until the mung beans has soften. In between cooking, you can test by softness by picking up one or two beans and test it. 3. Mix about three tbsp of sweet potato starch with some water for thickening the tau suan. 4. When the mung beans are soft enough, add the sweet potato starch mixture slowly with one hand and stir the tau suan with the other hand. It is important to keep stirring the mixture when adding the starch to prevent it from lumping up. Stop when the tau suan has reach the kind of starchyness that you like and turn off fire. Some people like it more starchy whereas some like it less. So you the amount of sweet potato starch to add depends on how you like it. 5. You can top off with some yu tiao before serving. For those who cannot get hold of yu tiao, you can instead add some thick coconut milk on top before serving. Spunkz, I realised that some places in Malaysia don't sell desserts that we can get in Singapore. Like in JB, we cannot find chengdol. Renaye, this is a very common dessert in Singapore. You can almost find it at any dessert stall at the foodcourt or hawker centre. 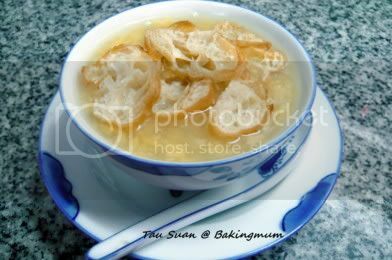 Hi, could u kindly send me the recipes for Tau Suan at michellejaw@gmail.com. Thanks!!! Michelle, I can briefly tell you the steps and ingredients needed as I did not measure the ingredients when I cooked it. Hi Baking Mum, thanks for the recipe.You made it sound so manageable. Will try it out. I love this simple dessert too! Opps, sorry I just realised your webpage was mentioned in the blogger's site..